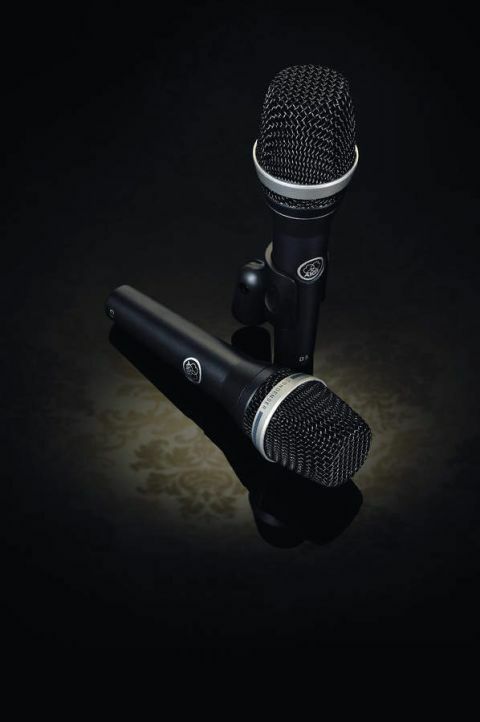 Quality build and performance from the microphone giants that will flatter a wide range of voices. Good quality and response. Good price. Handling can be a little bit noisy. The life of a live vocal mic is an unforgiving one: screamed into, spat on and dropped - it's tough. On top of this they are also expected to sound good on a wide variety of voices, reject the mass of unwanted noise on stage and not feedback too easily. And so it happens that AKG release a new handheld solution to this age-old arena: the D5 super-cardioid dynamic. The D5 is both sturdy and yet relatively light. We tested it against the classic Shure SM58. Before considering the sound, there are two major concerns for live vocal mics - handling noise and feedback susceptibility. The D5, as is typical with dynamic mics, is a little noisy in the hand. It also has a propensity to feedback at a lower frequency than the E935 and SM58 and took about 6db more gain to start the howling. The D5 has a super-cardioid pickup pattern, which makes it less prone to feedback and the pickup of off-axis sound sources. The sonic performance of this mic is a lot more accurate than the trusty '58, with well-balanced articulation across the vocal frequency range and enough sensitivity to capture dynamic extremities. In comparison to the E935, the D5 is slightly brighter with a fuller low end. The frequency range and transient response render a clear vocal performance, and the mid-frequency fuzziness that's common with dynamic mics doesn't trouble the D5. For the vocalist in need of a good quality mic that'll take a sound beating, I would happily recommend this mic for live use (I also used it for tracking guides in the studio and was pleased with the results). I'm conﬁdent that you'd be hard-pushed to ﬁnd competitors out there that better it at this price point.